The Warriors are the best team in the NBA. But are they the biggest hypocrites? That’s a question that some have been asking in the past week, ever since the Warriors signed Matt Barnes. Barnes fills a need with the injury to Kevin Durant. Barnes also comes with a checkered past as long as one of his tattooed arms. He was arrested on suspicion of domestic violence in 2010, though the charges were dropped. A couple of years later, he was arrested for allegedly threatening an officer. He pleaded no contest to misdemeanor charges of resisting arrest and driving without a license, and sentenced to community service, probation and counseling. He currently is facing misdemeanor assault charges for allegedly choking a woman in a Manhattan nightclub. And it’s true. The Warriors have some of the NBA’s most impressive men in their organization. But when there’s a need, does character take a back seat? Even that acknowledgment puts the Warriors in rare company. Too many professional sports teams — I can think of one local NFL team in particular — get defensive, obfuscate, deny or avoid the issue. Kerr is willing to talk directly about it. “It would be so easy if it were black and white, but you have to have a balance,” Kerr said. “You want to win — that’s why you’re here. If you don’t sign someone and end up losing, are they going to laud you for your moral fiber? Kerr has authority on the issue, both in specifics and broad terms. He had Barnes in Phoenix, when Kerr was the Suns’ general manager. He knows that Barnes is a fantastic teammate, the kind players love to have on their team and hate to play against. Kerr also played in the league, which gives him insight into how teams work. He was a squeaky-clean individual on high-character championship teams, but he had plenty of teammates who were different. Kerr didn’t name specific players, but he doesn’t have to. You have to look only at his playing history to see that he knows how good teams can absorb players who come with questionable reputations. The Chicago Bulls added Dennis Rodman and won three straight championships. The San Antonio Spurs added Stephen Jackson and won a championship. The key is balance. One player with a bad history can be assimilated into a high-character team. Signing multiple players with questionable pasts would tip the balance. It probably helps that the Bay Area has a soft spot for Barnes, who was a vital part of the “We Believe” Warriors in 2007 and didn’t have any legal issues in his first stint here. He knows that he arrives with baggage. “I have got in some trouble off the court,” said Barnes, who turned 37 on Thursday. “Most of the time, it’s reputation-type trouble. I’m a target and I realize that. I know coming here with what they have going on, I want to come in and fit in. I don’t want to stand out. I want to do a small part to help this team get another ring. It also helps that the Warriors have done enough, in the way they conduct themselves as an organization, to earn the benefit of the doubt. In the world of professional sports, it’s hard to have a team comprised exclusively of choir boys or girls. And, in truth, you probably don’t want one: different attitudes and backgrounds can enhance team chemistry and ability. “He’s not the first player we’ve ever had that has had some legal issues and he’s not going to be the last,” Kerr said of Barnes. “We’re not going to claim that we’re going be the milk-and-cookies gang all the time and that everyone is going to be perfect. Are the Warriors hypocrites? Certainly no more than other pro teams that tout high character. And probably less so than many, because at least the Warriors are willing to own the issue. It was clear that Kevin Durant’s knee injury would create problems for the Golden State Warriors as soon as the severity was announced last week. While the team with the NBA’s best record boasts more star depth than any other squad in the league, the rotation is not especially deep and isn’t necessarily equipped to withstand the loss of one of the NBA’s best players for a month or more. Add in that the injury came on just the second day of a very tough stretch of eight straight games in different cities (in just 13 days), and it was always possible that the Warriors would lose a few games without their two-way superstar. However, those ongoing struggles without Durant have been more serious than anyone expected. 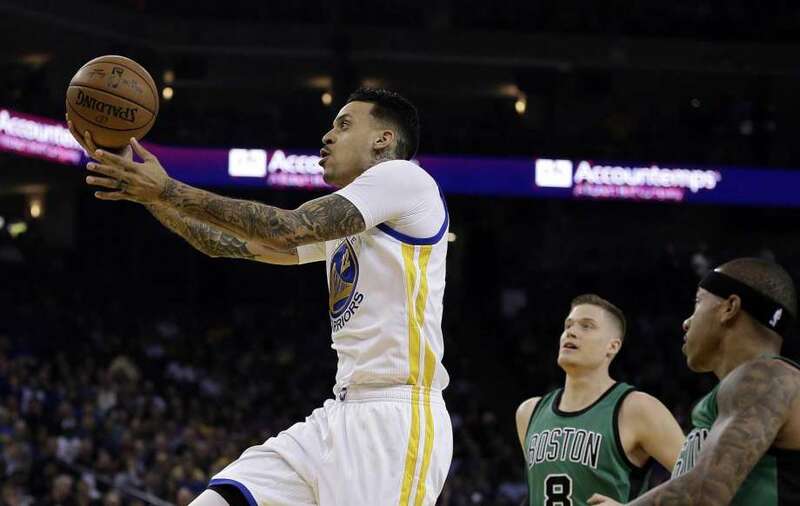 Those difficulties continued apace on Wednesday night in Oakland against the Boston Celtics. A short trip home before heading back out on the road offered the Warriors no comfort. In fact, they looked downright horrible during a fourth-quarter collapse that led to a 99-86 loss, their third in five games without KD. For a time, it looked like the Warriors were in position to pull out a win on a night when they clearly couldn’t find their best form. Golden State led 74-72 heading into the fourth quarter and 79-78 after a Draymond Green dunk with 7:18 remaining. The offense was sputtering, but a change in fortune was not out of the realm of possibility. Then everything went horribly wrong for the Warriors and extremely right for the Celtics. Kelly Olynyk answered Green’s jam with one of his own to start a 15-0 run that both decided and finished off the game. The Warriors didn’t score again until a Green three-pointer at the 3:47 mark, and any hope that it would start a comeback had to have felt like wishful thinking. The Warriors simply didn’t have the energy or ability to make a sustained charge. The Warriors have rarely looked worse. Facing a side well known for its rebounding struggles, Golden State could not get to a number of 50-50 balls and lacked the activity that has been one of the team’s trademarks in recent seasons. Frankly, the fourth quarter had more in common with the Antawn Jamison era than the Stephen Curry era. The Warriors scored only 12 points in the period and committed five turnovers against four assists, a shocking figure for a group that has made a habit of topping 30 assists all season. They looked exhausted, incapable, and just downright bad. The timing of this slump has created big problems for the Warriors at the top of the West. With three losses in the last nine days, they now sit just 1 1/2 games ahead of the San Antonio Spurs, winners of nine in a row (including a 28-point comeback without their two best players on Wednesday). It’s not inconceivable for the Spurs to overtake the Warriors when they face off at AT&T Center on Saturday night in a game that will serve as the second half of a back-to-back for the visitors. The way the Warriors are playing, it’s hard to imagine them beating a team as strong as the Spurs. It wouldn’t even be a surprise to see Steve Kerr rest his stars, perhaps allowing San Antonio to pursue homecourt advantage on its own terms. At this point, it’s hard to argue against giving Stephen Curry, Klay Thompson, and Draymond Green a night off. The Warriors have struggled to shoot from outside for a while now, with Curry going just 17-of-68 from beyond the arc in his last six games. Wednesday brought a 6-of-30 showing from deep, a ratio that would be glaring if it weren’t merely the worst in a string of poor shooting performances. Without Durant, the Warriors offense has looked wholly depend on shooting, and the lack of perimeter excellence has led to many iffy stretches. Golden State looks desperate for shots to go in and does not have clear control over its offensive execution. It’s tempting to shrug off these troubles as the result of losing such an important player during an especially hairy stretch of the schedule. After all, the Warriors have a stunning record of recent success and have proven capable of besting good teams with adequate rest. For that matter, the Celtics have now won three games in a row at Oracle Arena and hold the No. 2 seed in the East. Yet these struggles do not feel meaningless, in part because the circumstances of this season are so different from those of their record-setting 2015-16 campaign. It’s no knock against Curry to note that he has only intermittently found his paradigm-shattering MVP form this year, just as it’s fair to admit that the Warriors only made the NBA Finals last season because Thompson made so many absurd shots against the Oklahoma City Thunder. There is no guarantee that everything will work itself out simply because the Warriors aren’t used to being bad. If nothing else, the next few weeks should test how serious the Warriors are about prizing rest over the desire to take the West’s top seed. Kerr has said the team will make sure they enter the postseason with energy and health, but the Warriors also haven’t had to worry about seeding or the effects of playing only three home games per series much in the past three seasons. Will their competitive spirit take over once they see that they’re in a fight with San Antonio? Or will they see games like Wednesday’s loss as a sign that delaying gratification is their best chance at a title. When the Golden State Warriors schlep into the AT&T Center in San Antonio without Kevin Durant on Saturday night, just hours removed from a road game in Minnesota as life without their eight-time All-Star continues, the weight of an entire season will be bearing down on them. Lose this Best-of-the-West battle as they did in a stunning season-opener 129-100, and the head-to-head tiebreaker that could determine the No. 1 seed goes to San Antonio. Lose a few more games from there, and the Warriors’ worst-case scenario could be realized in a way that could cost them the title so many expected when Durant came last July. As hypothetical scenarios go, who would have thought the most likely option – the No. 2 seed Warriors v. the seventh-place Oklahoma City Thunder in the first round – would be the stuff of Russell Westbrook’s dreams and the Warriors’ nightmares? Just a few weeks ago, the prospect of them facing an overmatched eight-seed in the opening series – be it Denver, Portland, Dallas, or Minnesota – while fully healthy seemed to be a foregone conclusion. It’s that kind of a daunting challenge at the moment for the Warriors, who are reeling at a time when they had hoped to be coasting. On Wednesday night, when Durant spoke publicly for the first time since suffering a Grade 2 MCL sprain in his left knee and a bone bruise on his tibia in a Feb. 28 game against the Washington Wizards, his frailty was symbolic of theirs. Even with the internal optimism that he will return before the end of the regular season, it was striking to see him in such a vulnerable state. Durant entered the room with a walker, moving ever so slowly as he sat in a chair in front of the assembled room of media members. His spirits were high, but his expectations were low: straightening his leg was the day’s biggest accomplishment, right up there with hitting a few jumpers while sitting in a chair. As the Warriors learned a year ago, there can be hell to pay if your stars are having to heal this time of year. Steph Curry’s Grade 1 MCL sprain suffered in the first round had an undeniable effect on their failed title chase, one that still haunts them. Rhythm and swagger are hard enough to rediscover during the regular season, let alone in the middle of a pressure-packed playoff series where everything is on the line. Now, with the Warriors’ offense having disappeared without Durant (25th in offensive rating in the past five games) and the rest of the West smelling blood while they’ve lost three of their past five games, this is a familiar foe. “Very similar injury,” Curry said when asked to compare his situation to Durant’s. “I was kind of, I guess, in a more urgent situation with us being in the middle of the first round and not knowing how long it would take for me to get healthy, one, and get a rhythm back, two. But that’s the problem with the Warriors right now. For the purposes of Saturday night, they can only hope the Spurs’ Kawhi Leonard doesn’t have yet another MVP-caliber performance planned. We'll see come Saturday night at 8:30 ET on ABC. The 25-year-old small forward seized the NBA spotlight in just 24 seconds on Monday night, when he buried a late three-pointer against the Houston Rockets on one end and unleashed a monstrous block of fellow MVP candidate James Harden’s layup attempt on the other. It was the Happy Meal version of what Leonard (26.3 points, six rebounds, 3.4 assists, 1.9 steals per game) has been doing all season long, a well-timed reminder that the back-to-back Defensive Player of the Year should receive serious consideration in what has become a compelling MVP race. As if the Warriors didn’t have enough to worry about already. “We still want the number one seed,” said Warriors coach Steve Kerr, whose team will have played 17 of its last 24 games on the road by the time the Spurs game is done. “I won’t run guys ragged to get it. We want it, it would be nice to get, but you have to get through the season in one piece and pace yourselves a little bit. 0 Response to "Warriors address issues regarding signing of Matt Barnes"